1. The War Memorial, Caldbeck, Cumbria. 2. St Kentigern's Parish Church & Churchyard, Caldbeck. 4. 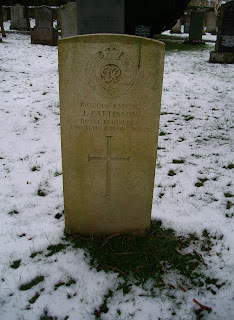 Headstone of Sapper James Pattinson, R.E. The parish of Caldbeck is in the county of Cumbria (previously Cumberland). Situated as it is amongst the northern Lakeland fells, in some respects it is one of the more remote and lesser known districts of the English lake District. Yet, it is also an area known for outstanding scenery, a traditional area of fell farming and until recently a strong tradition of mineral mining. The local churchyard is the final resting place of the legendary foxhunting huntsman John Peel (1776 - 1854) whose fame has been immortalised in the 'unofficial' Anthem for Cumbrians the world over, "D'ye ken John Peel" (i.e. "Do you know John Peel?"). In addition to being a hunting song, the tune of "D'ye ken John Peel" became adopted by the Border Regiment, the local infantry regiment traditionally recruiting men from the twin counties of Cumberland and Westmorland. The tune is still used as a 'quick march' by the Duke of Lancaster's Regiment, a successor regiment to the Border Regiment. Caldbeck churchyard is also the final resting place of Mary Harrison (nee Robinson) (1778 - 1837). A celebrated local beauty who has become known to the world as 'The Maid of Buttermere', Mary Robinson was the daughter of the landlord of the Fish Inn, Buttermere in the English Lake District. She was tricked into a bigamous marriage by an impostor, scoundrel and forger by the name of John Hatfield, Hatfield had passed himself off as an aristocrat from London. After the bigamous marriage he was found out, tried at Carlisle Crown Court, found guilty and hanged. Mary, the beautiful 'Maid of Buttermere', became even more famous throughout the land due to the writings of Samuel Taylor Coleridge, William Wordsworth and others. She later became a farmer's wife by marrying Caldbeck farmer Richard Harrison. In 1987, the Cumbrian-born author and local resident Melvyn Bragg wrote a semi-fictionalised version of Mary Robinson's story ('The Maid of Buttermere'). It was later adapted fo the stage. 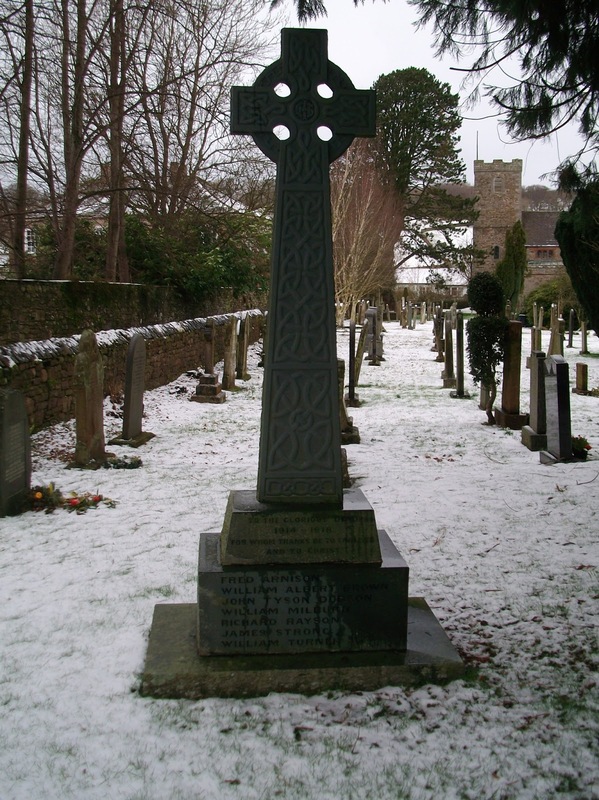 Caldbeck's War Memorial can be found in the churchyard of Caldbeck Parish Church (Photograph No 1). The plan for a War Memorial for the parish was first proposed in 1920 and it was unveiled 1922. Its original purpose was to remember those from the district who lost their lives during the First World War. The war memorial is made from the local stone, Skiddaw Slate, and is in the form of a Celtic cross. 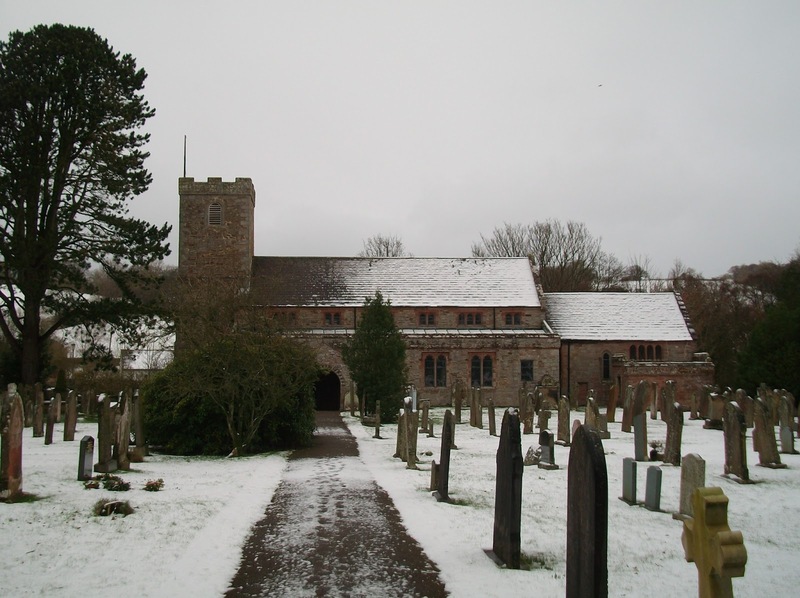 The Parish Church serving Caldbeck and district is dedicated to St Kentigern (also known as St Mungo). The church and churchyard can be seen in Photograph No 2 (above). The names of 7 people from Caldbeck and district who died in the 1914 - 1918 war are engraved on the front of the memorial. 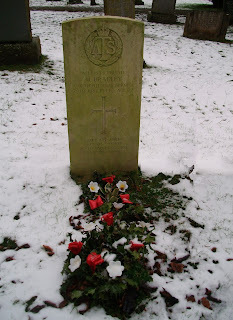 During the Second World War (1939 - 1945) a further 2 parishioners died serving their country. After the war their names were added to the right-hand side of the memorial (Photograph No 2). For whom thanks be to the Lord and to Christ. The headstone of Sapper James Pattinson can be seen in Photograph No 4. It does not have an epitaph engraved on it. Regiment/Service: Middlesex Regiment, 23rd Bn. Cemetery: LONGUEVAL ROAD CEMETERY, France (Somme). Panel Reference: Panel 85 to 86. Son of William Brown, of Sharpe House, Caldbeck, Wigton, Cumberland, and the late Grace Kirsopp Brown. Regiment/Service: Northumberland Fusiliers, 23rd (Tyneside Scottish) Bn. Grave Reference: II. I. 16. Cemetery: TROIS ARBRES CEMETERY, STEENWERCK, France (Nord). Son of Tom and Dorothy Dobson, of The Vennal, Caldbeck, Wigton, Cumberland. Regiment/Service: Northumberland Fusiliers, 4th Bn. Grave Reference: Plot I. Row E. Grave 23. Cemetery: HOP STORE CEMETERY, Belgium. Eldest son of Isaac and Hannah Milburn, of Church View, Caldbeck, Wigton. Regiment/Service: Border Regiment, 5th Bn. Grave Reference: III. E. 23. Grave Reference: XIII. C. 22. Cemetery: GREVILLERS BRITISH CEMETERY, France (Pas de Calais). Son of John and Helen Isabel Strong, of High Row, Haltcliff, Hesket Newmarket, Wigton, Cumberland. Grave Reference: L. F. 4. Cemetery: ETAPLES MILITARY CEMETERY, France (Pas de Calais). Son of William and Annie Turner, of Sand Hills, Bassenthwaite, Keswick, Cumberland. Cemetery: CALDBECK (ST. MUNGO OR KENTIGERN) CHURCHYARD, Cumbria. Wife of Albert Somme Bradley. (b) Sapper James Pattinson, R.E. Regiment/Service: Royal Engineers, 255 Field Coy. Son of Annie Pattinson, of Town End, Caldbeck. This article is dedicated to the courageous men and women of Caldbeck and district who gave their lives in the two World Wars. “To have courage for whatever comes in life - everything lies in that”.